Provide comfort for the family of Janet Kristopeit with a meaningful gesture of sympathy. Janet Louise Kristopeit, 82 of Arvada. Jan was born in Davenport, Iowa on October 29, 1936, she entered the gates of heaven to meet her Lord and Savior Jesus Christ on Friday, March 22, 2019. She passed peacefully with her family by her side. Jean is survived by her loving husband of 62 years, Phillip F. Kristopeit. She is also survived by her daughter Karen Kristopeit-Parker and her husband Robert Parker; sister Sally Becker and six grandchildren. She was preceded in death by her son Kevin Kristopeit and grandson Gregory Kristopeit. 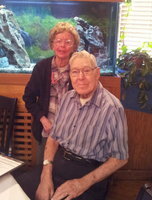 Janet & Phillip celebrated 62 years of marriage on March 2nd. Janet had an unwavering faith in God. In lieu of flowers memorial donations may be sent in her name to the church, Bethel Biblical. Provide comfort for the family of Janet Louise Kristopeit by sending flowers. My condolences to Janet's family. May your good memories of her give you peace and comfort during this sad time. Also, pray to God for comfort. Revelation 21:3,4 points to the time when sickness and death will be eliminated. We'll have the opportunity to see our loved ones again. (Act 24:15) I hope you find comfort from God's wonderful promises.